When playing Zelda: Breath of the Wilds on the Nintendo Switch, when I play with the Switch docked and the Joy-Cons physically disconnected, the left Joy-Con frequently "lags" or becomes disconnected from the Switch base unit altogether. When the left Joy-Con lags, the Switch acts as though whatever input I had been using was still being held down. For example, Link will occasionally keep running briefly even after I release the analog joystick. Only the left Joy-Con has this issue. The right Joy-Con always stays connected and has no lag issues. The issue doesn't occur when the Joy-Cons are attached to the Nintendo Switch base unit itself. I have applied the "day one patch" to the Switch, with the Joy-Cons connected to the base Switch unit as the patch was applied. There's also an article on the Nintendo Support site about general Joy-Con wireless connectivity problems. However, that article doesn't make any mention of the problem specific to the left Joy-Con. 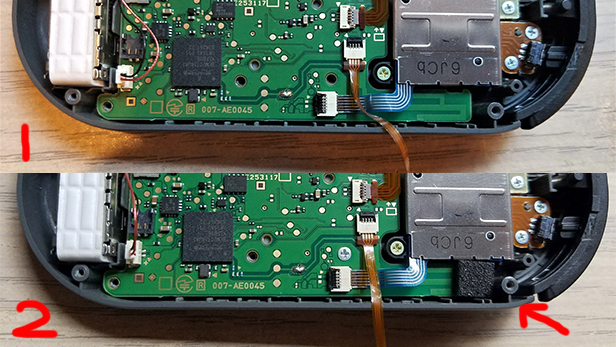 My question: How can I resolve this intermittent wireless connectivity problem with the left Joy-Con? This is a known design flaw which is only effecting early models of the Switch. It's something to do with electrical shielding (or something technical). If that didn't work, talk to Nintendo and they will "fix your problem for free" - which means you send in your joy con and they fix it and send it back. This can take up to 2 weeks. I have exactly same issue. Left JoyCon, lag most of the time, sometimes disconnects. Try to sit close to the console (like 1 meter) - this seems to helps a little but even then it happens every now and then. Otherwise you might want to consider exchanging to a different Switch console in the shop. They have also released an update to the Switch to help correct this issue. Make sure your Switch is connected to the internet and check for system updates. Finally, Nintendo says it will replace JoyCons if need be. They may have you go through a few troubleshooting steps first. Cell phones, laptops, tablets, etc. 3.0-compatible devices such as hard drives, thumb drives, LAN adapters, etc. Not the answer you're looking for? Browse other questions tagged hardware nintendo-switch or ask your own question. Were the Switch's left Joy-Con connection issues ever fixed? How to remove the strap from the Joy-Con strap? Any way to trigger home button with L Joy-Con only?